Enjoy the sunshine and protect your baby’s delicate skin with Green People Organic Children Sun Lotion. 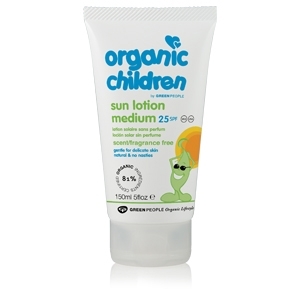 This organic and natural baby sun cream is SPF 25 and is suitable for babies and children, offering 96% UVB protection. A non-greasy, natural sun lotion for babies and children. Green People Organic Children Sun Lotion is a scent free, natural sunscreen which is made without Parabens, Lanolin, phthalates, artificial perfumes, petrochemicals and colourants to bring you a pure and natural baby sun cream.